Dozens of leather purses, wallets, fanny packs and other products are ready to be sold at the more than two dozen arts festivals Andrew and Kathleen Gilkerson will attend this summer. However, unlike many of the Gilkersons' customers across the Pacific Northwest, South Whidbey residents don't have to wait for an annual arts festival to purchase leather products. An Ace Leather Goods, Inc. store opened at the Jacob Center in Langley last fall, giving local residents year-round access to handcrafted leather products. Andrew Gilkerson started working with leather as a young adult living in California. "More than anything it kept me out of trouble back then," he said, smiling. He later bought a small leather shop with one sewing machine and some hand tools in Seattle for $500, found someone to purchase the finished products and began producing leather goods. "It just snowballed from there," Gilkerson said. Twenty-three years later, Gilkerson owns a workshop in South Whidbey where he works with his wife, Kathleen, and friend Hans Christiansen. The Gilkersons created Ace Leather Goods, Inc. in 1982. Their products are made with soft tanned leather which won't show marks if scratched, unlike dyed leather, a fact which Andrew explains to customers. "You have to start with good materials," he said. "Then spending the extra time with it gives you a better product." Producing a handcrafted leather product is a time consuming process. Purses, wallets and fanny packs are cut from a pattern, sewn to a matching cloth lining, zippers and handles are added and then pieces are stitched together. At Ace Leather Goods, the difference is in the details. Cording is used in the edging of purses. 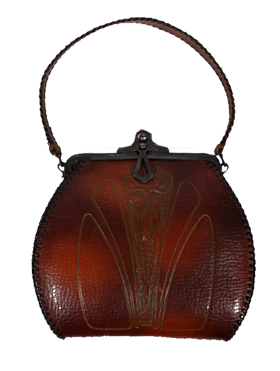 Wildlife designs such as a flying eagle or a leaping deer are stamped onto leather wallets and bests, or an Indian head nickel is added to accent belts before hand finishing. Belts and wallets are painted with several coats of dyes before they are sealed with wax. "Each one is an original, and it takes many hours to get it that way," Kathleen said. "Leather is an unforgiving medium--you make a mistake and it shows. Few people do hand finishing anymore." During the winter months Andrew may experiment with different styles belts, purses or other products, keeping customer comments he's heard year-round in mind. "I take a lot of pride in my work," he said. Owning a small business means the Gilkersons have to be knowledgeable in several areas -- sales, marketing, bookkeeping, product development and production. "We try to believe we have a better product than anyone," he said. "There's no middleman, so we can keep our prices low." Andrew figures he has the right formula, since much of his business is from repeat customers. I don't have an interest in selling someone one thing one time," he said. "Our customers, if treated properly, become our best sales people."